In terms of wild-and-scenic tropical beaches, Kauai's north shore is tops among the islands—and second place is distant. 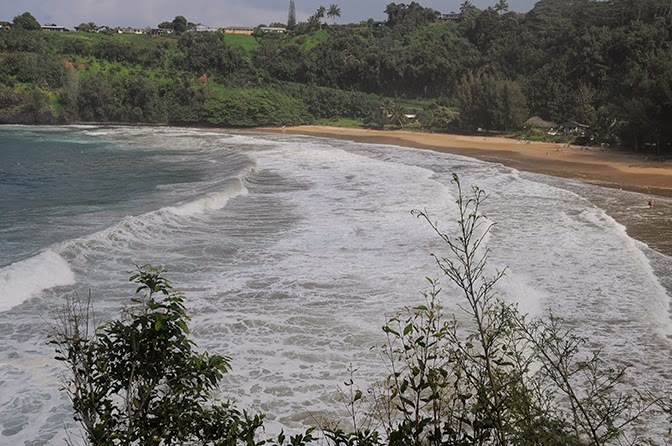 With all there is to do on Kauai, most visitors miss this little sandy bay with a wide stream and good surfing, which is fine by the locals who call Kalihiwai home. 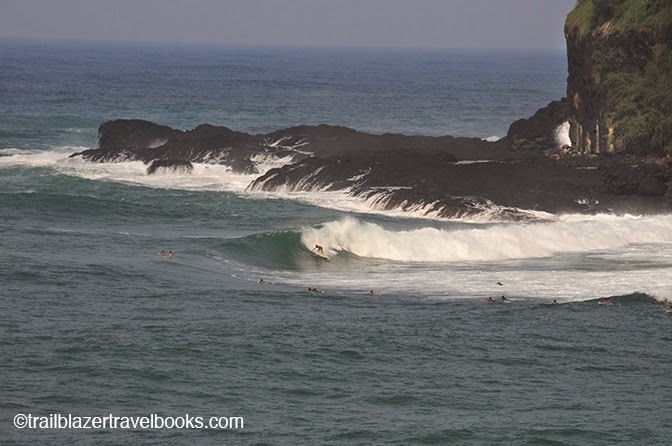 Ask surfers from all around the Islands, and they'll tell you the point break at Kalihiwai (kah-lee-hee-why) is a world-class wave machine, even if the wave sometimes curls around and does a head-on with the cliff. Visiting surfers might want to friendly up with the locals before heading out. The long curve of sand is good for family wave play. The backshore is an ironwood grove with palms, so shade is not a problem. Kalihiwai Stream enters the bay opposite from the point break, but this zone is well known to boogie boarders for several tiers of shore break. During periods with no rain, the stream is blocked by a sand dam at the beach, creating a lagoon swimming pond, with green, clear water. Kayaking upstream is a trip to Southeast Asia, albeit a quick one. You can watch these guys (including Titus Kinimaka and his hui) and wahines (Bethany Hamilton is sometimes around) from a turnout at the guardrail right above the beach. There's not much room on the shoulder—watch out for both the drop-off and passing cars. Kauai Trailblazer has more details on Kalihiwai, and all the other pieces to this coastal puzzle.